I'm not sure if the swipe to left for additional options is very intuitive. Yes, you show a hint in the beginning, but If you miss that, you won't find this "hidden functionality". Maybe a long-press context menu is better? Just yesterday I've been reading an article about UX mistakes and this one was one of them. To choose context menu or swipe was long brainstorm, before implementing that functionality. Many people just don't know about long tap, many does not know about swipe (mainly those without ios or tinder). So this is the topic I'm thinking about since yesterday again . Maybe the best solution will be to add animation, which "bounces" all rows to reveal that button for a second on every enter that screen with list? What do you think? I want it as much intuitive as possible! Maybe using the contextual action mode is how it should be done nowadays. 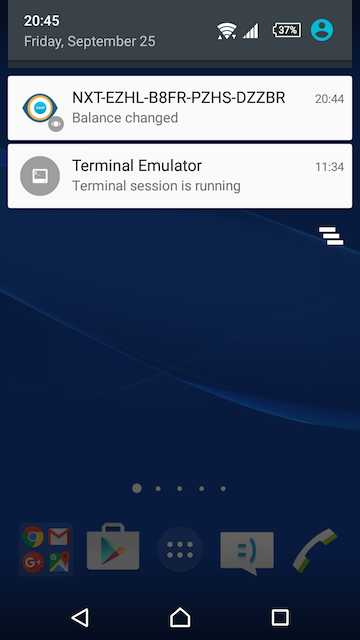 http://developer.android.com/guide/topics/ui/menus.html#CAB. I think the long-click is still "best practice" for such list-entry-specific actions. It's on todo list. And before that I'll check some other android appz how they do that. If you'll be using custom RingtonePreference your app needs to request the android.permission.READ_EXTERNAL_STORAGE permission in its manifest. New release out now! Added action menu for items in account list, also you can locally name account. Enjoy and happy new year! Can you tell me how you programmed this app? I would like to create one or two similar ones, just for me. - Allow to search account with alias. - Make balance activity work with ASK/BID orders. Maybe you could use Account Ledger feature to track balance more precisely. I am thinking about Account ledger to be implemented soon. About your first suggestion i have no idea - is that searching functionality in NRS API? Well, I just downloaded the android studio and made it. Not sure about your question . Well, I just downloaded the android studio and made it. That answers my question, thank you! Can you add additional information to the "balance change" notification. For example: "balance change +1.5 NXT". This way users can ignore notifications about insignificant events without opening the app itself. I don't know how to implement it but jnxt.org/nxt has such feature. -The amount in green only shows the guaranted balance "seems" while in red, shows the available balance "maybe works well this way, but seems unnecesary, most users wont care if their balance already have 1440 confirmations"
-Maybe also make transactions clickables and open it in a blockexplorer in the web browser "I suppose is easier than give all the information directly inside the app, also this would be even better"
In other aspects, it's fine, so keep improving it! Thanks for your feedback, guys!! Looks like new version come soon! You mean you copied your account number in web browser and while trying to paste it to form it did not work? - display transaction type, currently just shows debits/credits only. - show sub total after each transaction to see balance change over time. - ability to change time to AM/PM instead of 24hour time. 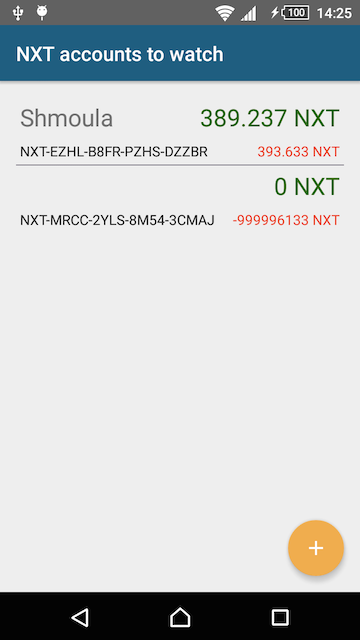 - nxt address is in grey text. hard to read. - add ability to click on transaction and copy the destination address and add that to your watch list. very awesome work... how did you go about creating this? what apps did you use or programming languages did you use? Hey guys, sorry for delays recently. Last month I even haven't been here on forum! I'm fulltime on some comercial project right now and hopefully it'll end soon, so I can provide update for wallet watcher. @box1413 thanks for ideas, some are already on my todolist, some questions has already been aswered. To clear it up shortly: duplicate amount on home screen is because on number is confirmed balance, second one unconfirmed. It will be merged in future to not confuse users. Transaction types will be visible after switching to account ledger. Accounts copying, date formating etc are great ideas, you can count with that . Regarding languages and apps - it's written in java (well, not by sun, but that stolen by google one ) in android studio, which is customized intelliJ ide. 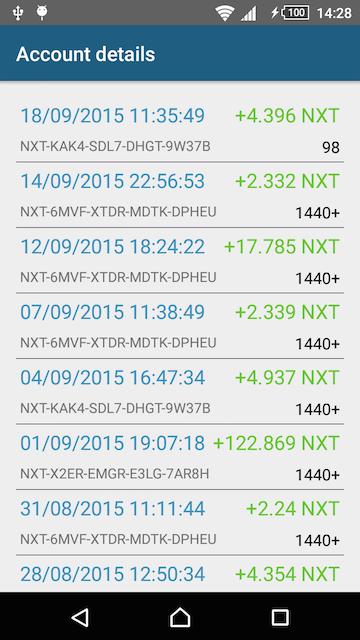 a few days ago I just started a new project - wallet watcher for android. So far I have core of the app done and moving towards notification service. Check out screenshots below or download app from the Google Play. Any feedback is appreciated! !